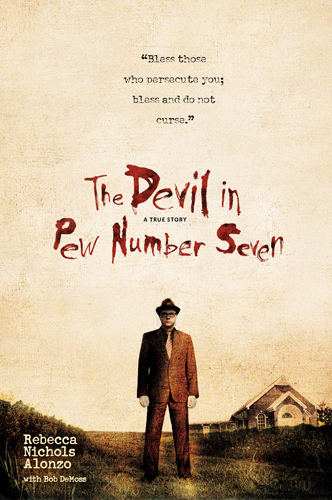 A Mom with a Blog: "The Devil In Pew Number Seven"
I just finished reading "The Devil In Pew Number Seven" by Rebecca Nichols Alonzo. It's been a while since I've read a book that I just couldn't put down. But this was it. The more I read... the more I wanted to read. What an incredible TRUE story! The book tells of the childhood of Rebecca and the difficult trials she and her family endured at the hands of a terribly evil man. A man who's jealousy would cause him to stop at nothing to run them out of town... even if it took years of tormenting them. By age 7 she had witnessed her parents being gunned down in her own home. And from the many years of being terrorized, had grown accustomed to sleeping with the fear that she may not live until morning. At such a young age she was exposed to trauma in her life that no one should fall victim to... let alone a child. And yet, through it all, she was taught a wonderful lesson of forgiveness, by her parents, who modeled what they believed. It would be a strong example of faith and trust in God that would never leave her. Her parents chose to trust God and believe that He knew what was best... and what the outcome would be. Several times reading the book I had my own doubts as to the decisions her parents made. Did they take it to far? Were they really hearing from God? But I was brought to tears as I read the outcome. To see what God can make of the tragedy in our lives is nothing short of amazing. I've heard it said that God uses every trial in our lives for our good... He doesn't waste anything. Rebecca's story is a wonderful example of this and makes it very real to me. She shares from her heart. But to know it's a true story? Wow. I enjoyed this book very much. It's beautifully written. Her story will stay with me for some time. If you need a lesson in forgiveness... this is it!